In 1989, change was in the air throughout all of Eastern Europe. Mikhail Gorbachev’s policies of glasnost and perestroika – openness and restructuring – signaled a radically different tone from Moscow and people in the Eastern Bloc took notice. The Berlin Wall, which had long stood as a concrete symbol of the clash between East and West, fell on November 9th. 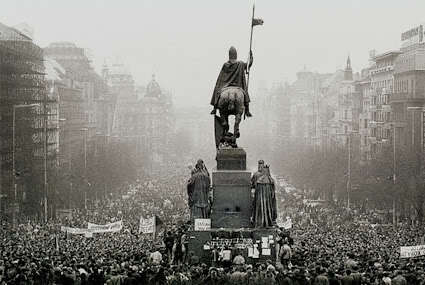 Czechoslovakia’s particular insurrection was known as the Velvet Revolution because of its relatively peaceful nature. It began on November 17, International Students Day, ironically enough at a government-sponsored rally, as Czech students filled Wenceslas Square to peacefully march in remembrance of the students killed by the Nazi occupation 50 years earlier. Protests began to swell to hundreds of thousands and the government, to its credit, realized it could not win by force and quickly gave in to popular sentiment. Elections for President were held in December and the new government started the long transition to democracy and a free economy. Theodore E. Russell was the Deputy Chief of Mission at Embassy Prague from 1988 to 1991 and tells of the peaceful protests, the work with the new government, and the Coummunist sympathizers in society as well as in the embassy itself. He was interviewed by Charles Stuart Kennedy beginning in February 2000. Read about the Prague Spring, the fall of the Berlin Wall, and the attempted coup against Gorbachev. 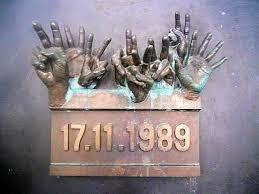 Go here to read about Hungary free from the USSR’s shadow in 1991. RUSSELL: In ’88 there were some odd things that were going on. For example, I remember going to a movie, called “Five Prague Pieces” I believe, where one of the vignettes was of a Communist movie critic who was discussing a film and progressively getting drunk and talking in Marxist jargon. He was smoking a cigarette and ashes gradually covered his shirt front. By the end he was just babbling. It was very unusual to see a film making fun of Communist jargon and depicting this guy as kind of a clown. Then in about mid-1989, [pictured, Milos] Jakes, the First Secretary of the Communist Party, made a secret speech to a session of the Central Committee, and someone taped it. I think the StB [Státní Bezpečnost] Secret Police did it actually. I think there were enough ambitious young Turks in the Secret Police who saw their country falling increasingly far behind, not making any progress economically and [Soviet Union’s Secretary General Mikhail] Gorbachev advocating reforms in the Soviet Union. These guys I think felt that the old leadership really should go. I think there was a certain amount of effort in Secret Police circles to have controlled modernization and reform a la Gorbachev…. 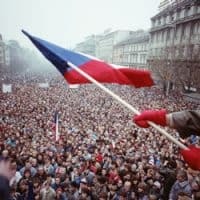 It was true that the Husak-Jakes regime was hopeless, but essentially Gorbachev pulled the plug on them, and because they had no real credibility or popular support in Czechoslovakia, as soon as the Soviet protective shield was lifted by Gorbachev, they crumbled when mass demonstrations broke out…. 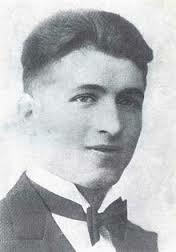 The 17th of November commemorated a date in 1939 when the Nazis, who had occupied all of Bohemia and Moravia March 15, 1939, cracked down on university students in Prague and killed one of them named Jan Opletal (pictured). That became a big date in the Communist calendar for anti-fascist demonstrations and parades. The Communist government actually struck a coin, which I have, showing the symbol of Charles University, barbed wire and gives the dates 17 November 1939-1989 to commemorate university students subjected to police brutality. They actually issued a beautiful silver commemorative coin celebrating the beginning of their own downfall. The government authorized a big demonstration by university students. About 30,000 students and others finally joined in. It started smaller than that, and then at one point in the demonstration the cry went out, “Let’s march to Wenceslas Square.” This was no longer an anti-fascist demonstration but an anti-government demonstration. 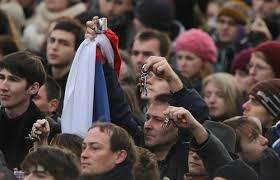 So the demonstration changed character and a march was started on the center of town to Wenceslas Square. At this point the police riot squads, which may or may not have known what was going to happen, closed in and beat the hell out of those demonstrators trapped in National Avenue who dared to march on Wenceslas Square, the historic site of anti-government demonstrations. They beat them very brutally and there were a number of concussions and serious injuries. There was a rumor started that a student had actually been killed. No one was killed, but a lot of people were severely beaten, including a half dozen Western correspondents. That was the start of the revolution because these university students were the cream of Czechoslovak society. Their parents and brothers and sisters and grandparents saw these university students beaten bloody by the riot police and it just set off a huge protest in Prague and then nationally. The next day, things started moving and people started coming into the streets. Then every night the demonstrations became larger. At first, you would have 50,000 then 100,000 then 300,000 taking to the streets. The government just didn’t know what to do about it. It gathered steam and within a week it had gotten beyond government control. The reformers, led by Havel, proclaimed a national general strike for November 27 at noon, and they did it very cleverly. They proclaimed it for just two hours during the lunch hour. Sure enough during the lunch hour, whistles went off and people briefly had a national general strike showing great solidarity with minimal economic damage. At that point it became pretty clear that the Communist Party apparatus had lost control. The Communist Party Politburo leadership had already resigned and then other hardliners, including [Miroslav] Stepan, the hardline Prague party chief, quit before the general strike…. 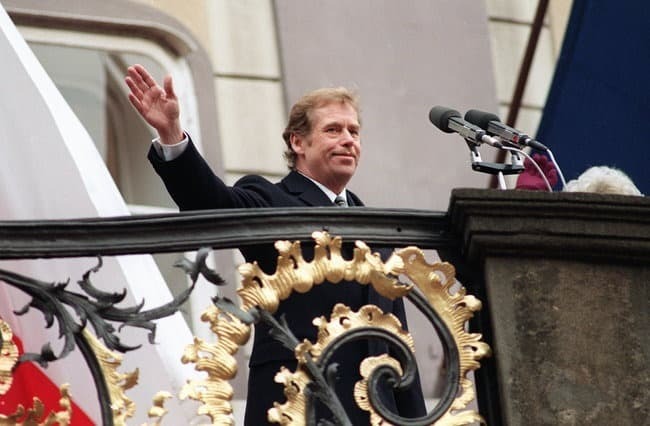 What happened in Prague was literally that leading dissidents like Havel, supported by theater directors and actors, dissident intelligentsia and university students came together in theaters across the city. Every theater was packed and dissident spokespersons went on the stage to formulate demands, including the end to the leading role of the Communist Party. In Prague, Havel (below right) organized Civic Forum the day after the beatings in National Avenue and the next day a group of Slovak artists and intellectuals organized the Public Against Violence movement in Bratislava. Then the university students, as the thing got mobilized, fanned out to factories and got the workers on board. Little by little the movement spread out from Prague to the countryside. The Communist government didn’t know how to react. We were thinking that when you have a 100,000, 200,000 or 300,000 people in the streets, this was a revolution. So all U.S. resources at our Embassy were monitoring what the hell was going on and talking to as many people as we could and trying to figure out if this was for real and if this was for keeps. I think when the general strike succeeded, we figured this is really serious. The government doesn’t seem to be able to do anything about it. The reporting we were getting suggested that they had not decided to use force and were debating what to do. The people’s militia we thought was more likely to do something violent than the military, but if the military had been ordered to use force, they might have obeyed. Fortunately, the leadership lacked the will to put up a fight once the strength of the revolution became clear. We started seeing the reaction of some of the politicians which was very ineffectual. For example in downtown Prague, we watched the tough, relatively young Prague party boss, [Miroslav] Stepan, trying to rally factory workers. He had earlier played the reformer and had even gone to New York and spoken to various groups portraying himself as a Communist modernizer in the Gorbachev mold. Actually he was a first-class SOB and one of the few Communist leaders eventually locked up after the Revolution. But he got up in front of an audience of factory workers in Prague. He addressed them and said, “Don’t let yourselves be led by these children.” The workers, and I saw the film of this, the workers were quiet for a second. Then they started chanting, “We are not children, we are not children.” They just kept chanting. He looked nonplussed, and finally just turned and walked off. The leadership [of the Czech Communist party] simply could not believe what was happening to it. It was also clear the Soviets were not going to back them up, and they just dissolved like the Wicked Witch of the West when water was poured on her…. We are talking about a revolution but not a bloody one. At no point was it bloody. We are talking about the Communist regime collapsing and then, by the end of the year, a non-Communist, democratic government coming in. [Leader of the 1968 Prague Spring Alexander] Dubcek was named head of the National Assembly and Havel was then elected President by the end of December. That was just the final confirmation of success, because by early December it was clear this was for keeps. The leading role of the Communist Party was abolished. The border was opened with Austria. You had a rapid crumbling of Communist power and a non-Communist majority taking over the government on December 10 for the first time since the 1948 Communist coup. President Husak, who had replaced Dubcek in 1969, then resigned. We were in close contact with the dissidents, had been and continued to be. We knew what the dissidents were doing, although they were so busy we weren’t able to see all that much of people like Havel and Father Vaclav Maly who were in the middle of conducting a revolution. We had not been able to keep up contact with Dubcek during his internal exile, but resumed contact when Havel brought him into the leadership of the revolution. But yes, we were talking to dissidents constantly and finding out what was going on. There was one interesting thing that some of us were reminded of as we watched events unfold. One of the top assistants to Deputy Foreign Minister [Evzen] Vacek, in the fall of 1988, after they suppressed the demonstration in Wenceslas Square, was talking with me. He said, “As long as there are five or ten or 15,000 people involved, we can handle that. Now if it ever got to be 100,000…” We remembered that. That was what actually happened. The size of the demonstrations got way beyond what they could control and they simply folded. Q: Did you find members of the Communist regime beginning to almost look for safe haven and sort of coming over and chatting with you all and sort of preparing the way, rats deserting the ship and that kind of thing? RUSSELL: It wasn’t that we were a safe haven for them, but in the very early stages, before the revolution, before the 17th of November, we were getting some strange approaches from people in the government saying there really are reformers among us who want better relations with the U.S. We were getting intriguing approaches like that. When the demonstrations had started we began getting funny approaches from people we knew were connected with the Secret Police saying there are some forces among them who are reform minded and asking how we might react to them. We said essentially, “We don’t want to talk to them. We don’t trust them. Forget it.” There wasn’t anything we could offer them or would have offered them. The regime collapsed amazingly quickly. By the time of the general strike, it was pretty clear the Communist Party was losing control, although they still had the security apparatus if they decided to use it. Then it was a matter of the reformers increasing the pressure and their demands until the Communist Party leadership was squeezed out of the government and the Communist regime collapsed. It was wonderful mingling with the crowds during the first two weeks after November 17 and watching them react as one person to the speakers. I remember hundreds of thousands of people up on Letna Hill near Prague Castle jangling their keys in unison to signify the “last rights” for the Communists. I remember my wife and I attended these demonstrations, particularly the one up on the Letna plain. I remember we were being filmed by the Secret Police still at that time during the middle of the demonstration a week after November 17. The Czech crowd was incredibly disciplined. They are a disciplined people, and particularly in this truly national uprising, people were thinking and acting in unison. You had perhaps 800,000 people. At one point an ambulance had to get through and everyone just opened up and allowed it through the packed crowd. It was like a flight of birds or school of fish would move. The crowd would move as one. It was absolutely peaceful, absolutely disciplined. I remember at one point there was this stir in the crowd and unusual pushing and shoving. A sort of a flying wedge pushed through the crowd trying to move up nearer to the stage. What was going on? It was a flying wedge with [CBS anchor] Dan Rather pushing his way through with a film crew trying to get up closer to cover this event…. We were so busy I don’t remember much normal business being conducted. The embassy was basically trying to keep track of what was going on. We didn’t know at first whether the regime would call out the troops to put down the demonstrations. It became pretty clear after a week or two that they were not going to and there was not likely to be any major violence. So after that we weren’t worried so much about evacuating Americans as we had done in 1968. We were basically trying to determine how definitive the changes seemed to be and reporting developments promptly to Washington. We had the clearest view of what was happening in the Foreign Ministry. As a new government came in, they didn’t immediately fire everybody. They couldn’t. This was true in most ministries. Even the Secret Police didn’t fold up their tents and disappear right away. Even during the big Christmas and New Year’s celebrations we saw signs of some police surveillance. In the Foreign Ministry they went about replacing people fairly gradually. I remember going in and talking to one of the new Deputy Ministers who was in charge of personnel security. He was saying basically that Ministry employees working for the StB and ratting on colleagues were being fired. If, he said, they were working against the West, it is a bit different. He would vet them on a case-by-case basis, but they are not the ones he really was going to go after. He was going after the ones who were doing internal espionage against their colleagues. 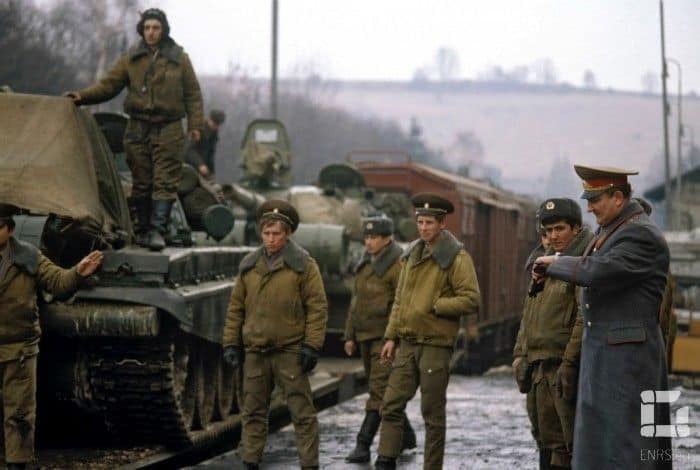 The Czechs took a harder line vetting people than the Slovaks and did purge most of the people who had been Communist security functionaries or had worked for the KGB…. The dissidents, Havel, Jiri Dienstbier, Radim and Martin Palous, Rita Klimova, Sasha Vondra, Zdenek Urbanek, Jan Urban and other leading figures with whom we had been meeting periodically, appreciated the fact that we had supported them very strongly when they were out of power and the Communists were harassing them. So when they came in, we had exceptionally warm relations with President Havel and the new Czechoslovak government. So every section of the Embassy developed a very close working relationship with their new Czechoslovak counterparts. There is one interesting story I’ll share where Havel came in as President and yet was surrounded by people wearing the old Communist Security Guard uniforms. He hated the sight of these uniforms and wanted them changed. We heard that he asked the man who designed the costumes for the film Amadeus [directed by famed Czech Milos Forman] to design new Palace Guard uniforms. [Ambassador Shirley Temple Black] was very adept at using the very warm contacts she and her staff had established with the dissidents to then carry over into the new government relationship. She had a very good relationship with President Havel and members of his staff like Sasha Vondra, who later became Czech Ambassador to Washington, and other members of the government…. The main thing we were concerned about was how we could help Czechoslovakia succeed. So one of the things the U.S. embassy did was to beef up our own resources to cope with this. We had a very small staff in Prague. We were absolutely overwhelmed at first because we were starting to get normal government-to-government relations. In the old days we just reported what the Communist government was up to and whether there were any signs of cracks in the ice. Now we were reporting the success of major programs and the results of demarches on all kinds of issues where Czechoslovakia was helping us, as they did in the Gulf War. So we were acutely understaffed…. I think that the initial inclination of the new Czechoslovak government was to do the opposite of whatever had been done before. In the case of the Warsaw Pact, it was to do the opposite of having a military alliance. So the feeling was to let the OSCE [Organization for Security and Cooperation in Europe] handle Czechoslovakia’s security concerns. Let’s not get locked into another alliance. There was a “let’s abolish arms sales” idea that Havel also came up with. There was a general amnesty. A lot of criminals were actually let out. The police force was rather demoralized. However, in overall terms, what Havel did for Czechoslovakia was fabulous. Not only did he get favorable world attention and put the seal on this dramatic change in direction, but I think he motivated his own people and was an inspiration during a very difficult transition. For example, the GDP [gross domestic product] was going down after the revolution, not up. Many people felt they were better off economically under Communism. But in the context of his very idealistic approach, which I think was very appropriate for that revolutionary period, I think you had some things that were done that were perhaps politically unrealistic. Q: How did they treat those who had cooperated with the police and those who didn’t? The Czechs have a pretty tight society and they had been working on this for a long time. RUSSELL: I think almost everybody was involved. I think that Havel (at left) for example, recognized that in a speech where he basically said, “We are all guilty including me.” Of all the people I can think of he was the least involved, and one of the people who most strongly represented idealistic, consistent dissent even at great personal cost. But he insisted everyone is compromised to some degree and therefore people should not judge each other too severely. Now they did on and off develop a so-called “lustration” or personnel-vetting procedure for people who worked for the Communist security apparatus to make sure they were not going to be employed in sensitive government positions. So they went through a certain amount of purging of people who had very specific Secret Police and high-party affiliations. A very few people were locked up, but they weren’t kept in that long. Basically they had been trying for a policy of reconciliation, and the deal when they took over was if you wretches will step out of the way at this point, we are not going to shoot you, hang you or really persecute you. Just get out of the way and let a decent government come in. That was the deal that was struck. Had the Communist party security apparatus leaders feared for their lives, I think they would have resorted to force rather than simply slinking away. Q: What about our embassy? There must have been an awful lot of people there who had been highly cooperative with the secret police. Otherwise, they wouldn’t have gotten their jobs? RUSSELL: That is a fascinating question. I am sure it was true throughout the Communist bloc. We knew that the Czech and Slovak employees at the Embassy had to go to meetings with the Secret Police periodically. I think it may have been weekly, but I am not sure. I know our maid during our first tour appeared to be going to weekly reporting sessions…. After the revolution, we got some information on what had been going on. The information confirmed this impression. However, there were some FSNs [Foreign Service Nationals] who were actually officers in the Secret Police. I don’t know what the highest rank was. I think it was a colonel. These “professionals” were a sinister lot, but at least I think we had identified most of them…. However, most of the FSNs were passive or reluctant cooperators who had to answer questions and who I think probably avoided giving information which they thought might hurt their U.S. colleagues. There were constant efforts at physical penetration of the Embassy, constant efforts using personnel to try to infiltrate the Embassy and efforts to compromise Embassy personnel. I remember a security expert discovered that an extra computer terminal had been set up on our unclassified network. It turned out a line had been run through the wall in the Admin section to the next door Police Station. However, I think the StB was unsuccessful in penetrating classified security areas. Everything that occurred suggested that unless they were actually working for the Secret Police, most of the FSNs were not out to get us, and were a fine bunch of people. I feel very warmly still towards many of them. They weren’t always fired as soon as they were identified, as we figured the StB would just stick someone else in. You work with the devil you know. But when they did something really stupid, we would have to sack them. There was this one guy who was a real pain in the neck, who was incompetent at his Embassy job in addition to being a secret policeman. He put a bug in a packet of curtain samples that were going up to the Defense Attaché’s office. Now they didn’t let anything unexamined enter the Defense Attaché’s Office in Communist Czechoslovakia. So naturally it was screened and they found the bug in it and this idiot, who had carried it up there, was fired. This was the same guy who my wife found in our apartment fiddling with our couch which had been turned on its side. There was a guy named Joe Kaplan, who was above him and was one of the top StB people in the Embassy. We knew who he was and that he was a bad apple. The FSNs knew who he was and when he asked us to let his dog breed with our champion dachshund, an FSN approached me and badmouthed Joe’s dog as having a bad back. We turned down Joe’s offer and later found big nails driven into our four snow tires stored in the Embassy garage. I guess he was mixing business with personal motives…. 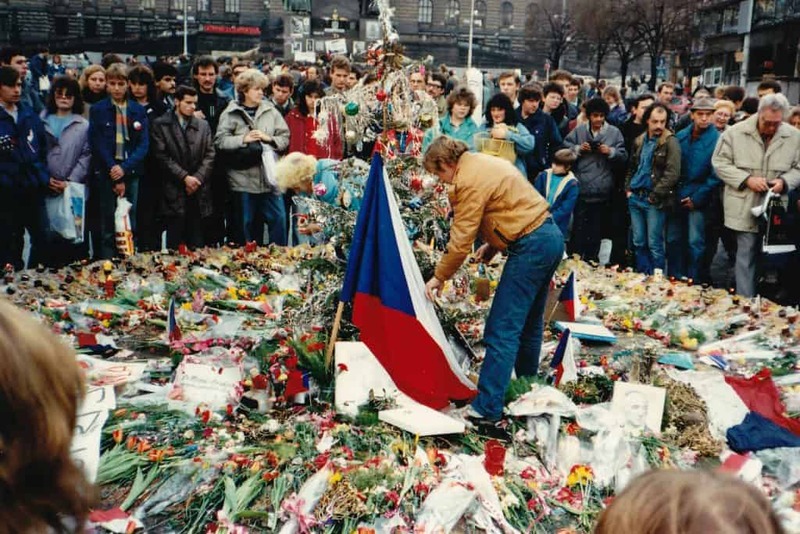 There were Soviet troops in Czechoslovakia after the 1989 Velvet Revolution until June 1991. Michael Kocab, who had been a hard-rock musician and composer, became one of the leading members of the new Parliament. 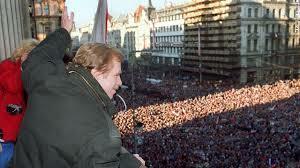 He was a big friend of President Havel and a very tough- minded, smart guy. He was put in charge of negotiating the withdrawal of the Russian troops. I remember he told me at one point, “Well, I’ve gone from hard rock to heavy metal.” He negotiated the withdrawal and the Soviet forces did pull out of Czechoslovakia. The Czechs had made it clear they wanted them out of there as quickly as possible. During their stay the Soviets simply dumped the bottom of the tanker car gasoline and oil into the sandy areas around their main base and it went straight into the aquifer. When they left they took the plumbing, doors and windows out of buildings. It was a very unfriendly leave-taking. They managed to trash everything and caused a huge amount of pollution over time. In Slovakia they made the same environmental mess, but left under different circumstances. 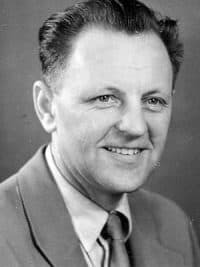 Even some of the leaders of the dissident movement like the Christian Democratic Party leader Jan Carnogursky took a much friendlier approach on the Soviet departure. Whereas in the Czech Republic there weren’t any bands seeing them off, in the Slovak part of the country, they did have cordial departure ceremonies…. Czechoslovakia had moved from authoritarianism to democracy and the Cold War was over. It had been a fabulous assignment.